This week, I received a copy of Aerin Lauder's first design tome, Beauty at Home. I am slightly addicted to beautiful coffee table books and while most of them are pretty, Beauty at Home really resonated with me on a deeper level. Not only is it filled with gorgeous images, Aerin's personal insight is incredibly inspiring. She is a style icon and a true inspiration for so many of us, so the book is a veritable treat. Over the past year, Aerin has expanded her empire beyond the world of Estee Lauder, establishing her global lifestyle brand, AERIN, inspired by her own effortlessly stylish lifestyle. While I was Director of Marketing at Visual Comfort, I worked closely with her team leading up to the launch of her lighting collection and even had the opportunity to visit her chic offices in New York. We're actually using several of her chandeliers in one of my client projects. It will be gorgeous! It is quite impressive to see the way that the AERIN line has grown so quickly, but it is no surprise. Who wouldn't want to live as beautifully as Aerin Lauder? One of my favorite rooms in Aerin's homes is the fabulous library in her Manhattan apartment. The doors with geometric detail frame the room so perfectly. 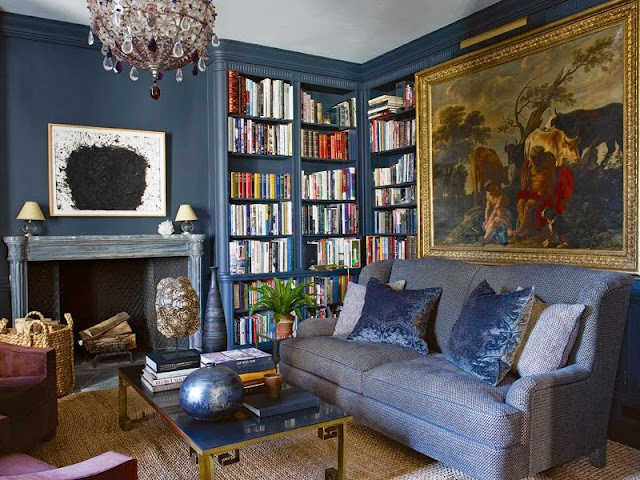 The Prussian blue walls and built-ins feel rich and inviting and provide a striking backdrop for the incredible art and furniture in the space. I do a lot of tone-on-tone color in my design work and seeing that Aerin loves doing the same makes me feel that much more passionate about it! The fabulous coffee table with its Greek key detail was the inspiration for a similar table in her furniture line for EJ Victor while the stunning chandelier has been reproduced by Visual Comfort for the AERIN collection. Which element in this beautiful library is your favorite? Do you have a favorite room from one of Aerin's homes? Gorgeous Paloma, i ADORE IT ALL HOWEVER THE DETAILS ON THE COFFEE TABLE ARE SO STRIKING! what an incredible ability to style such a dark room with brightening accents. gorgeous wall color. Gorgeous. Love the color of the walls, and that chandelier is amazing. I am an Aerin fan! Love her style!